The Pipeline and Hazardous Materials Safety Administration (PHMSA) issued a final rule on October 18th. As you know, the only way to amend or change Title 49 for Transportation in the Code of Federal Regulations is through a rule making process. This particular docket number is HM–259. Its goal is to “align the U.S. Hazardous Materials Regulations with current international standards for the air transportation of hazardous materials”. It has an effective date of October 18, 2018. While the published rule is 23 pages long, I have attempted to hit the highlights here. If you wish to read the entire final rule with the discussion on comments received, you can go to https://www.phmsa.dot.gov/regulations-fr/rulemaking/2018-22114. 172.101 – Removal of A3 and A6 from Column 7 for multiple entries in the HMT. Provision A3 will be removed from all Packing Group I entries. Provision A6 will be removed from all liquid entries to which it is assigned. 172.102 – A3 revised and now reads as follows: “For combination packagings, if glass inner packagings (including ampoules) are used, they must be packed with absorbent material in tightly closed rigid and leakproof receptacles before packing in outer packagings.” There is no longer a mention of using “tightly closed metal receptacles”. Q. If there are multiple skids of dangerous goods (overpacks) in a shipment on which one should the copies of the invoices and shipping papers be attached? A. Neither the DOT nor IATA regulations tell you to put “paperwork” on the outer packages or overpacks. That is a carrier/driver thing. All the regulations care about is the proper marking and labeling that they require. You also have to be able to physically hand your paperwork to the carrier. Your best bet would be to talk to your carrier directly as to how they want it handled. 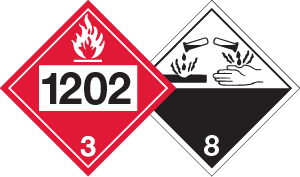 Q. I have a liquid with a flashpoint of 100° F and it does not meet any other hazard classes. It is not an RQ, waste or marine pollutant. 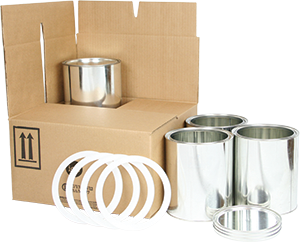 After manufacturing, it is placed in tubes and then shipped for sale in retail stores. What marks and labels are needed on the outside of the packages?